Schön restaurierte Penthouse-Wohnung im vierten Stock eines Pariser Stil Gebäude mit nur 8 Wohnungen. Fantastische Lage nach Buenos Aires zu sehen. Die Wohnung wurde über 9 Monate restauriert, um den Grand Living zu Beginn der 1900er Jahre zurückfordern. Kein Aufwand wurde gescheut, um die reiche Gefühl mit dem importierten Holz neu, während immer noch die Modernisierung der Küche und Badezimmer. Wöchentlicher Reinigungsservice inklusive. Sehr hohe Decken mit kunstvollen Stuckarbeiten gekennzeichnet durch das Holz Detaillierung und Original pinotea norwegischen Holzböden, die eine warme Atmosphäre zu schaffen. Es gibt eine Eingangshalle, ein separates Wohn- / Esszimmer und ein Hauptschlafzimmer mit einer luxuriösen Queen-Size-Matratze und luxuriösen Betten mit einem voll ausgestatteten Badezimmer mit Whirlpool-Badewanne und Dusche. Zweites Bad "Loft-Stil" über der Küche mit einem Doppelbett und einem halben Bad. Designer Küche mit Gasherd, Geschirrspüler und Kühlschrank. Waschmaschine auch. Das Wohnzimmer verfügt über eine Stereoanlage von Bose Wave und Kabel-TV mit einem neuen Smart TV, der mit dem Internet verbunden ist. Highspeed-WLAN in der Wohnung. Stimmungslicht in jedem Zimmer. Haushaltshilfe einmal pro Woche. Air für den Sommer und Zentralheizung (Wasserzwangs Heizkörper) im Winter bedingt. Es gibt einen Aufzug (Schmiedeeisen im Pariser Stil), so dass Sie nicht so viele Flüge hinaufgehen müssen (es sei denn, Sie arbeiten mit dem großartigen Essen in Buenos Aires zusammen). Das Badezimmer ist aus dem Schlafzimmer und ist komplett ausgestattet mit Jacuzzi Badewanne und Dusche. Es ist ein wenig klein, aber es ist alles da! Maid kommt wöchentlich, wenn Sie länger als eine Woche sind. The property was as described and as pictured in the photographs but was bigger and more charming than we had anticipated. We thoroughly enjoyed our ten nights in this apartment. It is in an excellent location close to bus and subway stops, shops, grocery stores and restaurants. Walking distance to Recoleta Cemetery, Jardin de Japones, as well as other parks in that same area. The apartment had a well stocked kitchen with all that we needed in order to prepare some of our meals. Shower worked well for us throughout our stay as did the washing machine. Dave was so easy to deal with and was readily available by email if we had a reason to contact him. He has a terrific House Book with all kinds of useful infromation about the city and its sights as well as lots of dining out suggestions. His team of Miguel and Hector made our arrival and departure easy. We loved our ten day stay in Buenos Aires and think that having the apartment made it feel like we were home! Absolutely will be recommending this aprtment and Dave to friends and family and would stay there again should we travel back to Buenos Aires some day. Lots of old world charm as well as the best of modern amenities! Dave was so helpful, and Miguel met us at the door when we arrived to show us around. The House Book was indispensable, with hints about transportation, money exchange, local restaurants and pubs. We will definitely be returning!! Loved it. The apartment is located in a moderately busy street in Palermo. Miguel acts as backup if you need anything or there are any problems. Dave is a very helpful host who responses quickly to messages and provides excellent information both about the apartment and local facilities. The apartment is very spacious and charming in an old world way. It has all the basic facilities required. It is in a city centre and does not have modern window fittings so there is some city noise but caused us no problem. We particularly appreciated the space and the overall quality of the apartment. Dave arranged for taxi driver Hector to collect us from BA Airport. He was very efficient and took us directly to the apartment. Can’t say enough about Dave’s apartment and its location. The photos don’t do it justice! It was been a perfect place for us, walking everywhere. Restaurant favorites so far have included Proper (I think my number one), Toro 777, Anafe for Sunday brunch (killer.) going to Roux tonight. Na Serapia our favorite for empanadas so far. Unfortunately LaAgua is on vacation and closed. Will give us another reason to come back! Communication was easy and great. Thanks again! We loved our “home” base in BA for our second visit to the city. David made it so easy to slip into life there. The most comprehensive House Book took care of all the details. The only issue we had with the internet connection has been updated. The recommended laundry, coffee houses, take-out ideas, and booked transport from EZE helped us jump start our five-day stay. Miguel was excellent getting everything organized inside the apartment. Don’t miss the street art free ($10) walking tour in Palermo Soho. Or the longer Graffitimundo tour. For rainy days, we enjoyed the Museo Arte Moderne and San Telmo market. We also took the ferry to Colonia Uruguay - would only recommend if you’ve experienced everything else BA has to offer. Will mention there are stairs to negotiate to the kitchen and bathroom. I am an Argentinian living in the US. This apartment was the perfect one for me and my family when visiting our country. 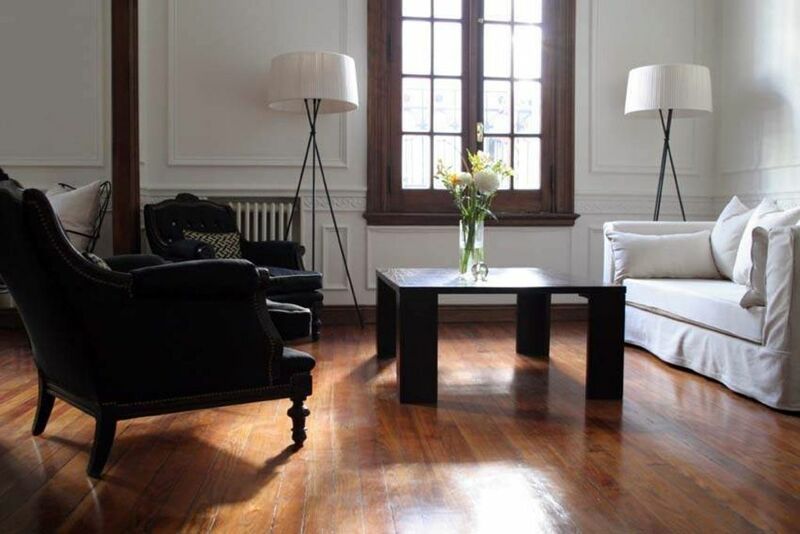 The location is perfect (not Recoleta as advertised, actually Palermo), near public transport and walking distance to a lot of restaurants, shopping mall and ant kind of shops. The building is a super quiet one, and the few neighboors we met were really nice with us. The apartment is super quiet, no noises from street or from neighbors, and you will find everything you will need to cook or have a breakfast. The internet was not working properly in the beginning but Miguel was super responsive and diligent to solve it. Even dough he was capable to find someone to come to fix it on January 1st!!! My only concern is the water heater, it doesn’t work properly and thet was frustrating. Impossible to have a good shower. Too hot or cold are the options if its working... if not working (most of the time) the only option is cold water, wich wasn’t a big deal because we were on Summer. I would rent it again if needed, I really love it!!! Glad you enjoyed it, Paula, and thanks for your comments! The apartment is perfectly located between Recoleta and Palermo near the Alto Palermo shopping centre - sometimes Google Maps shows the street as Recoleta so sorry if that was confusing. Sorry you had trouble figuring out the hot water! We have the instant on hot water to ensure you always have hot water with great pressure! It is also essential in the winter as it powers the forced water heat in the radiators throughout the apartment. We explain in the book to run the hot water first and then adjust if you are having a shower to get the flow right. Another great option is the bathtub - it is a Jacuzzi so you can run a hot bath and have a relaxing soak with the jets! We have updated to a smart TV since your visit and found a better internet provider so we have high-speed internet now with the latest download speed test 27.59 Mbps. It was great Miguel could arrange the internet fix for you on Jan 1 but that can't happen again. Thanks again for all your comments and glad you had a nice trip. Die Wohnung befindet sich in der Nähe eines großen Supermarkt sowie erstaunliche Feinkostläden, Obstmärkte, Käse Geschäfte und Weingeschäfte. Es gibt eine große Havanna Café ganz in der Nähe sowie eine hundert Jahre alte Café und eine Bar (Tolon) einen Block entfernt, die 24 Stunden geöffnet ist. Die besten Sicheln sind zwei Blocks entfernt, aber es gibt konkurrierende Bäckereien und eine hausgemachte Pasta-Shop, die das Wasser im Mund machen werden. Gut, dass es ein Fitness-Studio in der Nähe, falls Sie zu arbeiten, so dass Sie mehr genießen wollen! Zu Fuß zu den überall mit dem Vorteil der Taxis vor der Tür und die U-Bahn einen Block entfernt. Dies ist der beste Ort, um Buenos Aires zu sehen. Die Nachbarschaft liegt zwischen Recoleta und Palermo und in der Nähe von 4 Buslinien und der U-Bahn / Subte-Linie D. Wir lassen Ihnen zwei Subte-Karten in der Wohnung, damit Sie den Zug und die Busse bequem nutzen können. All pre and post stay cleaning fees are included. Weekly maid service on stays over seven days. Rates are subject to change until confirmed. We don't have any hidden fees! Contact us for longer stays.